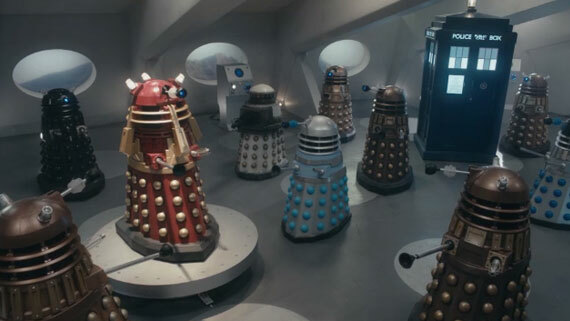 "Davros created the Daleks - but who created Davros?" 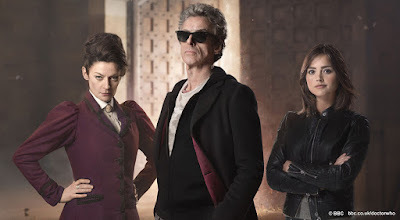 If you're reading this blog then I don't think I need to remind you that Doctor Who is back on TV for its ninth series since it returned - Peter Capaldi's second series and Jenna Coleman's third- and apparently final - series. This week's opening episode is the first of a two-part story so it's difficult, and somewhat unfair to give a full review without seeing the second half of the story. Nevertheless, what I can say is that I enjoyed this season's opening episode more than I did last year's opener 'Deep Breath'. 'Deep Breath' felt overlong and it struggled to hold my interest for its full duration. 'The Magician's Apprentice', on the other hand kept my interest throughout - from the spectacular pre credits sequence to the unexpected cliffhanger. The episode moved along at quite a frantic pace - in fact almost too fast. In the space of about fifteen minutes we visit at least half a dozen different locations and at least three different time periods. 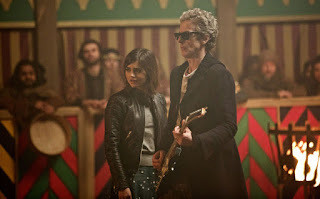 Characters both familiar and unfamiliar come and go until, just to add to the sensory overload, the Doctor makes his big entrance riding a tank and playing the guitar. Things settle down a bit in the second half as the Doctor, Missy and Clara travel to Skaro for the Doctor's confrontation with Davros. This was the biggest surprise for me. Although I tend to avoid spoilers I did know that we were likely to see a young Davros in this episode. So the pre-credits revelation of the young boy's identity was not a surprise to me. However what I was not expecting was that we'd also see the older Davros that we're so familiar with, played once again by the excellent Julian Bleach. The Daleks themselves seem to be much more in the background in this episode which seems to suggest that this is mote about Davros than it is about his creations. We had 'Genesis of the Daleks' back in 1975 now it looks like we're finally getting 'Genesis of Davros'. Several people on the message boards have said that supposedly killing Missy and Clara as well as destroying the TARDIS is dramatically unsatisfying because we know they can't really be dead. This is true but it's only we, the audience, who know that they can't be dead. The Doctor doesn't know this. So the real drama is in how the Doctor responds to his friends' apparent deaths. That's why we have the final cliffhanger which seems to suggest he's prepared to kill in order to save them. All in all I think it's an impressive return for the series and I'm looking forward to seeing where the story goes next week.